As I examined the elevation chart provided by the Race Organizers, I was excited to see the sloping downhill trajectory of the course as it wound down scenic Provo Canyon, and thought this could potentially be a great PR race. I learned that although there is significant downhill, there are also a few rolling hills along the way. Elevation charts can be so deceiving sometimes.The day before the race, Utah Valley Marathon puts on a nice little expo. I love expos! I don’t know if anyone else does. I like to go to every booth and see what they have. I chatted with some very cool people from the Saints and Sinners half marathon, which we did last year. They remembered us! They gave me a free shirt. I also stopped to chat with the folks at the Phoenix Marathon, another very cool Saturday marathon. They have some really cool swag. If you’re looking for a marathon in AZ, you should definitely check them out. Saturday, I got up around 2am (with that “Did I even sleep?” feeling), got ready, and headed to the marathon buses just after 3am. By coincidence, I saw my friend Matt at the parking lot and we headed up to the starting area. The temperature at the starting area was in the 40s, which is cold to this Las Vegas runner. I had just left 100+ degree days in Vegas! Fortunately I brought some cold weather clothing. They also had some nice fires to warm yourself by.As the start time approached, I shoved all my warm clothing into my drop bag and headed over for a picture with the Marathon Maniacs. I lined up near the pacer for my goal time and we were off! The views along the course were beautiful. Running into Provo Canyon you see beautiful farmland, Deer Creek reservoir, Provo River (my favorite) and Bridal Veil Falls. There was a small glitch at the mile 7 aid station. There were no gels! One of the runners near me was visibly upset. I always pack my own because you never know what will happen. For example, maybe I’ll miss grabbing gels or they won’t have a flavor that appeals to me, so I try to carry enough to get me through most of the race. In the beginning, there are some speedy downhill parts. I stuck near my goal pace. Even after the first hill, I was still going strong. After the half, I was doing great. I was on pace for a PR. Then, after the rolling hills around mile 14, my calves started cramping up. I’m not sure exactly why. I personally think it was due to the intense downhill followed by hills, then downhill again, then hills. Switching gears dramatically like that seemed to take its toll. At this point, I was just trying to maintain near my goal pace as I waited for the calf issues to (hopefully) clear up and a second wind to arrive.A wind arrived but not the one I was hoping for! We got hit with a headwind towards the end of the canyon. The headwind frustrated my race further. Nonetheless, I kept trying to maintain hoping circumstances would change. As I watched my PR slip away, I became discouraged and lost motivation to dig deep and finish strong. I guess I could have saved a few minutes off my time by pushing harder. The last few miles were tough. You can see the finish line 1-2 miles away from you but it seems to take forever to get there! Nonetheless, I finished with my second best marathon time. It’s a strange feeling because although I finished with my second best marathon time, I felt like I didn’t execute as well as I would have liked. I felt like I executed better at the Seattle marathon even though my time was not as good. The finish line is great. I loved seeing my friends and family cheer me in to the finish, and it gave me a boost to sprint to the end. 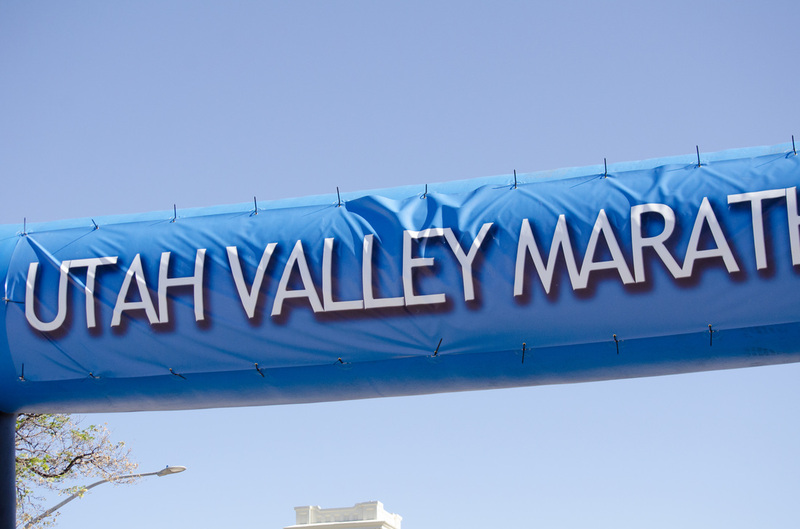 Utah Valley has a very cool large medal for finishers. Their race shirts are also very nice. The finish area is fun with lots of nice recovery items, a PR bell (which I didn’t get to ring, lol), free massages, and even bounce houses for the kids. I opted to get my sore calves rubbed with Deep Blue at the DoTerra booth. This isn’t the end though. They also have a Kids 1k! I love when races do this. It was even free! A great way to promote fitness for children. My two oldest kids had a blast running the 1k and they got to finish at the same finish line with the marathoners. They also gave the kids some nice medals.Overall, it’s a great marathon. If you’re looking for one in Utah, check it out. The organization is solid. It’s a beautiful course. We were graced with some great weather. The medal and shirt are fantastic. Yes, it’s mostly downhill but there are some solid hills! Feel free to post comments or questions about this marathon below.